A few months ago my wife Becca and I renewed our Costco membership and went on a shopping spree. When you’re at Costco you lose not only your sense of scale, but your sense of right and wrong. 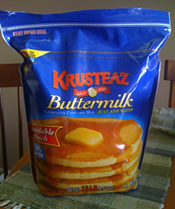 I’ll be the first to admit that a 10 pound bag of Krusteaz pancake mix really has no business existing in the first place… but we bought one anyway. Enter the monstrosity you see pictured here to the right. Flash forward three weeks later and Becca suddenly declares that she hates Krusteaz pancakes. We hadn’t gone and gorged ourselves on pancakes, so it wasn’t like she was just temporarily sick of them. Oh no, it was much worse than that – she just up and decided that she could no longer eat pancakes made using Krusteaz mix ever again. To put this madness in perspective: I’ve been buying the small boxes of Krusteaz mix from the grocery store since before Becca and I even met. She’s been eating these pancakes for the past seven years – AMPLE TIME to decide that she didn’t like them before we bought a bag of the mix large enough to feed a small African village for a month. It was already ludicrous to buy that bag to feed just two people, and I don’t think that I can fly this mission solo. I could try to give some of the pancake mix away, but I don’t think that dropping off ziplock bags full of white powder at my local food bank is going to go over too well. Instead, my current plan is to dump half the bag on Becca while she’s taking a shower (the beauty of this mix is that you only have to add water), and then to slowly consume the other half by myself over the course of the next 19 months. That’s right, the “use by” date printed on the bag is September 2012. Becca and I could theoretically conceive a child, give birth to it, and teach it to say the word “pancake” in the time it will take for this mix to expire. If I have to eat all of these pancakes alone, however, I’ll be expiring long before then. I’m sure Jared and others could help you empty that bag. But why did Becca suddenly start hating (by hate I just mean never eat them again) them? I hope you weren’t joking about dumping it on your wife. That would be hilarious. MC-EG: But why did Becca suddenly start hating (by hate I just mean never eat them again) them? That’s the question. The answer is that she’s either pure evil, clinically insane, or a combination of both. Chris S: I hope you weren’t joking about dumping it on your wife. That would be hilarious. These pancakes are disgusting! I remember when Mom tried to feed us this crap. Anything less than Bisquick pancakes is an abomination. Jonathan Mallahan: Anything less than Bisquick pancakes is an abomination. I think Bisquick pancakes are mediocre at best, plus they require more effort (yes, adding an egg and milk is a considerable amount of effort for me in the morning). I’m all about the Krusteaz pancakes, especially since I can just eyeball the water and mix to the right consistency. PRO.